Imam Bayildi (Baked Aubergine Heaven) Gluten and Dairy free. This recipe takes about 15-20 minutes to prepare the aubergine, then if you make the flatbreads whilst the aubergines bake you can be all ready to eat within an hour of starting. 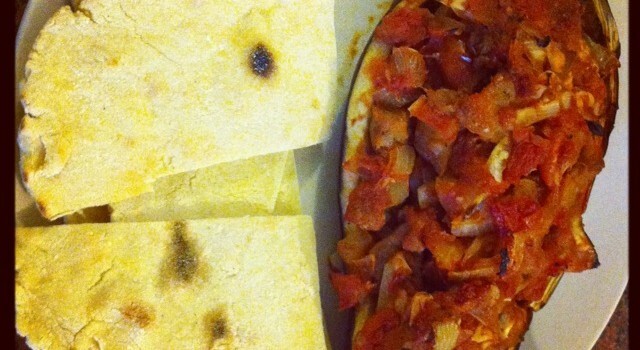 So it’s not super quick, but you could cheat and buy flatbread instead or use pitta. Cut the aubergine in half and use a spoon to remove the flesh, leaving a cavity. Chop up the aubergine flesh. Heat the oil in a pan and cook the onion for a couple of minutes, then add the garlic and aubergine. Now add the tomatoes, puree, spices, sugar and lemon juice. Season and let it simmer. Place the aubergine skins on a baking tray, spoon the mixture back into the skins and drizzle with a little olive oil. Bake for 30 minutes at Gas Mark 4. Mix the rice flour and coconut together in a bowl. Add the water bit by bit and mix to form a dough. I find this easiest after a while to do on a worksurface. Using a floured surface divide the mixture into 6-8 pieces. Use the palm of your hand and fingers to flatten each piece to a round. Cook in a dry pan for a few minutes on each side, the flatbreads should look mottled. 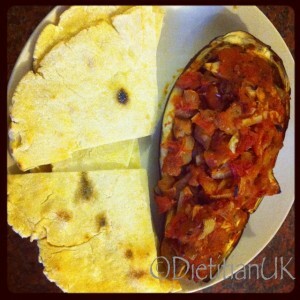 Serve the aubergine with flatbreads, use the flatbread to scoop it out or spread it on. Get messy and enjoy.